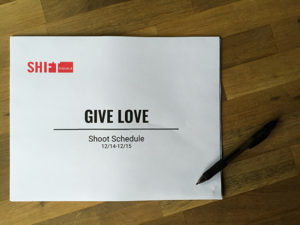 Concepting for Give Love took place in the fall of 2015, and shooting happened in mid December. Give Love. That was the inspiration for our 2015 Christmas video that we shot on and around Broadway in downtown Green Bay, WI. We knew that we wanted to give something back to the community that had welcomed us as a new business just a few months previously, so we decided to spread some Christmas good cheer! Consequently, the ‘Give Love’ video concept came to life. The holidays are a time for family, sharing and sisterly love. 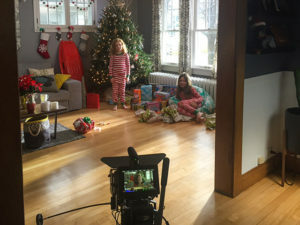 We cast a local family, and sisters Gwendolyn and Maddy stole the show! The wonderful Dana Michele took care of Hair & Makeup. The stars of the spot relaxing between takes. 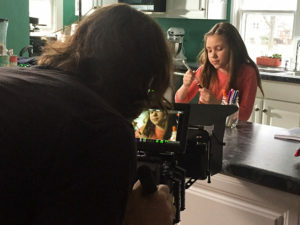 Shooting took place over two days at a local home, the historic Meyer Theatre, Kavarna Coffeehouse, ZuLou, and Petal Pusher with a special cameo from Joplin Japhet. Exteriors were shot on Broadway in Green Bay, Wisconsin. We were able to really define the direction, because for this shoot, we were our own video production client. We shot ‘Give Love’ in RED 5k because that gives us a huge amount of flexibility in post production. As a result, we had tons of data to wrangle over the two day shoot! We wanted to get the video released before Christmas, so we had to make the post production process quick. So, after we shot on the 14th and 15th of December, we released the video on the 18th. The video shoot took place over two days in Green Bay. A young girl is the center of the story. She’s lost her favorite bear. While making their Christmas lists, her older sister notices the bear is on her list to Santa. Because she wants to Give Love, she sets out on a mission with her dad to reunite her sister with her bear on Christmas morning. Awwwww! Aren’t sisters the best?! Finally, if you want to get back into a seasonal mood, take a minute or two to watch our Christmas video, and keep your eyes peeled for our Christmas video in 2016! In our first year of business, we wanted to do something to say thank you. Thank you to everyone who has helped us grow, learn and belong in downtown Green Bay. Please enjoy our video, and go ahead and give love. It is Christmas, after all!